Good news today. I’m only going to say good things. Jordan saw his eye doctor last week, and they said “usually this procedure stops any further damage from the disease….I’ve never seen it actually reverse the damage!” Jordan’s eyes are better!! Thank you God. Jordan says the doctor was surprised and happy. Bob had a strawberry shake today and held it down. He’s also had plenty of fluids that he’s held down. He feels well enough that he wants to go to church “just for the singing” tonight. Mom is a rock star. Could be the strongest person I know. Never complains, never asks for anything. Just keeps a good attitude and keeps on moving. While at the cancer center today we told the nurse that she was a bit wiped out, they drew blood, her H&H was 7 & 23. Her blood pressure still very low. So she’s walking around with half the blood as a normal person….and not complaining. She was treated with IV fluids and will get 2 units of blood….but holy crap mom!!! She is a rock star. Good advice. I’ll just stand by Jesus too. This made me cry. 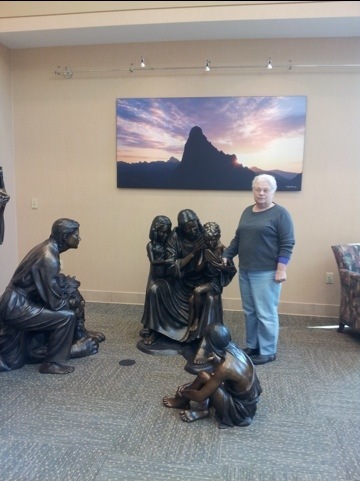 I love this picture of grandma standing by Jesus. We will stand by Him and He will stand by us.